Looking for a g-free treat to send in for a class party? Every year I make about 100 of these for my girls’ holiday parties in December and every year they are a big hit. They’re a go-to party treat (for other holidays, too — just change the sprinkles!) as all the kids love them and they’re allergen-free. 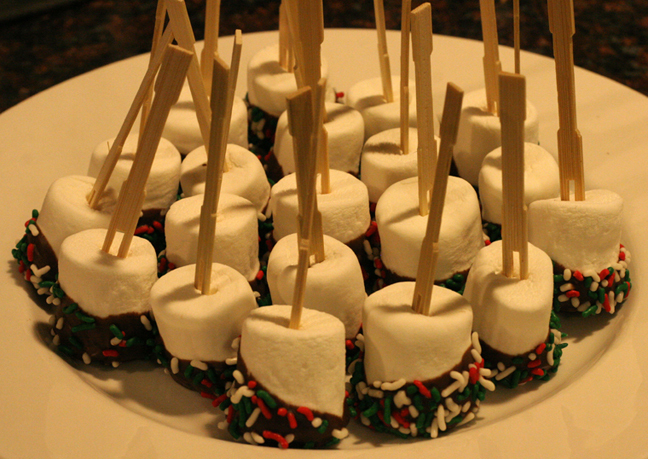 Just poke sticks of some sort through marshmallows, dip in melted chocolate, add sprinkles and put on wax paper. Freeze for a bit to set, then refrigerate if using them soon. If you’re making them ahead of time, you can just freeze them in an airtight container and let them thaw out in the fridge the day before, or just on the counter the morning of the party. You could also use mini candy canes instead of sticks, or crushed candy canes instead of sprinkles, etc….anything goes! 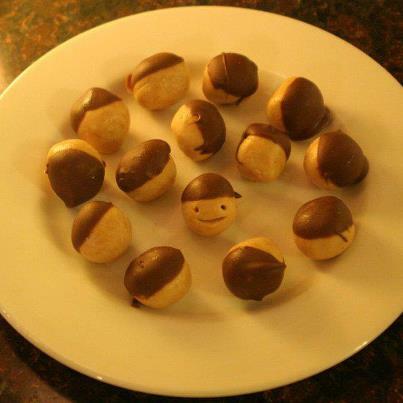 Want a simple candy recipe that will tempt both young and old alike? Trying to find a sweet gift idea that your kids can help with? 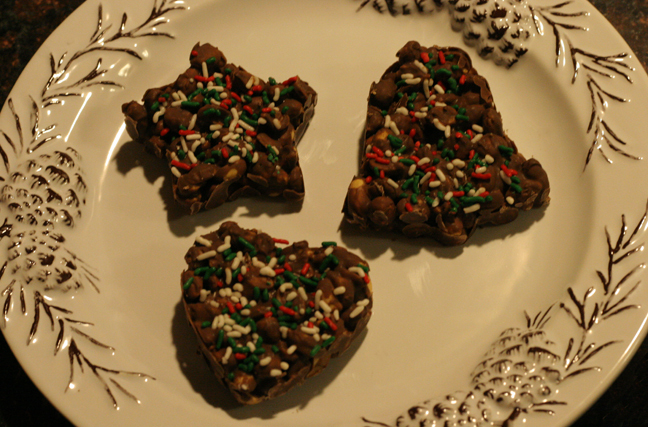 Then whip out your holiday cookie cutters, some peanuts, chocolate chips and sprinkles. Instead of your classic, free-form peanut clusters, just melt chocolate and mix with peanuts til they’re coated, and spoon the mixture inside cookie cutters til all the spaces are filled. Then add holiday sprinkles, freeze til solid, then pop them out of the cookie cutters and put a few into a festive cellophane bag with a ribbon to give as gifts to neighbors, the postman, etc. Want a quick, refreshing dessert idea to surprise your family? 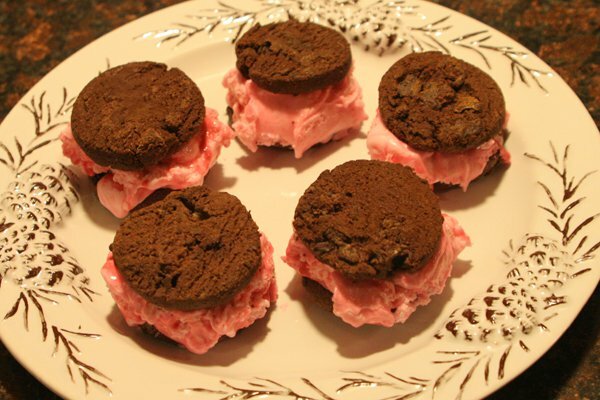 Then make these mini ice cream sandwiches, using Pamela’s Products cookies filled with ice cream. Get crazy and roll the edges of the ice cream in holiday sprinkles or crushed candy canes for extra color. Any flavor ice cream and cookie will work! Looking for a finger food that is sure to be a big hit? 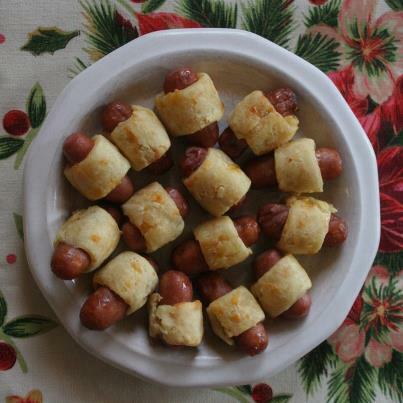 Then make these mini pigs-in-a-blanket, using Chebe bread mix (you can use their regular bread mix, cheese bread or breadstick mixes). Just make the mix according to directions, roll out and wrap pieces around GF mini hot dogs, and cook according to directions for mix. So savory and so good…if you’re lucky enough to have any left, they reheat very well, too. Preheat oven to 350. Mix all ingredients and spoon into 9″ pie plate. Bake at 350 degrees for 25 minutes or until lightly browned. Garnish with chopped tomato and green onions if desired. 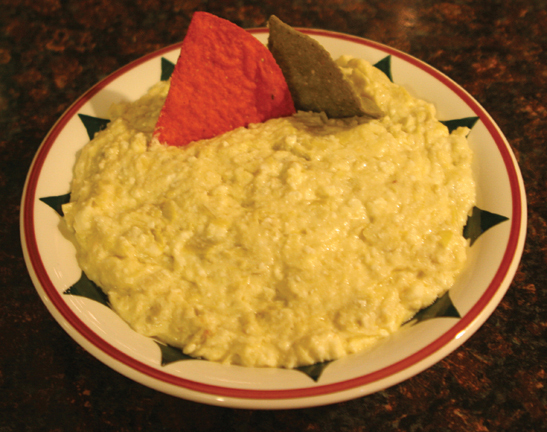 Serve with G-F tortilla chips. Hope you’ve enjoyed our holiday family favorites. I have some more recipes to come soon, which are a little more time-consuming than these, but worth the time if you have it. In the meantime, if you’d like to see 27 more of our favorite kid-friendly recipes, you can download a free PDF at this link. This entry was posted in Activities for g-free kids, fun for kids, g-free recipes, holiday, kids in the kitchen, recipes and tagged christmas, desserts, fun ideas, g-free kid, holiday, holiday recipes, holidays, ideas, kids helping, parties, school parties by kachalmers2. Bookmark the permalink. Need to bring a dip to a Thanksgiving party. Going to make the Hot Feta Artichoke Dip. Sounds delicious! It’s a dip contest. Hope I win!